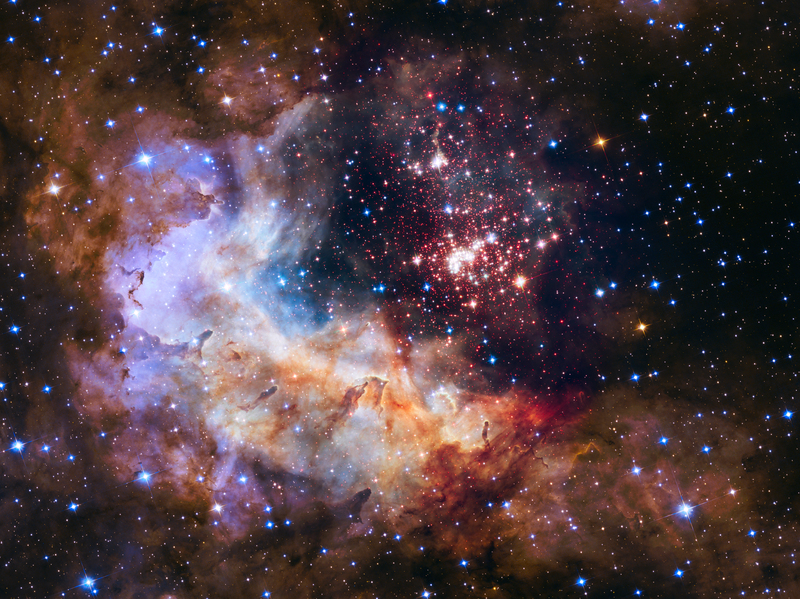 HUBBLE’S OFFICIAL 25th ANNIVERSARY IMAGE • Credit: NASA, ESA, the Hubble Heritage Team (STScI/AURA), A. Nota (ESA/STScI), and the Westerlund 2 Science Team. The brilliant tapestry of young stars flaring to life resemble a glittering fireworks display in the 25th anniversary Hubble Space Telescope image, released to commemorate a quarter century of exploring the solar system and beyond. The giant star cluster is about 2 million years old and contains some of our galaxy’s hottest, brightest and most massive stars. The brilliant stars sculpt the gaseous terrain of the nebula and help create a successive generation of baby stars. When the stellar winds hit dense walls of gas, the shockwaves may spark a new torrent of star birth along the wall of the cavity. The red dots scattered throughout the landscape are a rich population of newly-forming stars still wrapped in their gas-and-dust cocoons. Because the cluster is very young – in astronomical terms – it has not had time to disperse its stars deep into interstellar space, providing astronomers with an opportunity to gather information on how the cluster formed.